Wshful Review | Three Exciting Syndicate Lottery Game Bundles! I was skeptical about Wshful at first, but I came away truly impressed. Wshful bucks the trend as far as lottery sites go. They don’t offer regular solo play games, scratch cards, or any other interactive games—which, honestly, might make lottery site purists raise an eyebrow or two. But don’t count them out yet! Wshful largely succeeds in what it sets out to do: offer a simple, yet fun lottery site for syndicate lovers. It’s not perfect, mind you. But for the most part, it works, and it works well. Wshful is an lottery agent that provides an automated way of participating in lottery syndicates. It’s a totally legit way of increasing your chances of winning, and the service is very reasonably priced. You don’t have to choose lotteries, numbers, or manage anything at all – Wshful will do all the work for you. Depending on which subscription you choose, you can participate in up to 6 syndicates for Mega Millions and Euromillions, and each syndicate is composed of up to 88 members. Essentially, Wshful makes joining lottery syndicates totally hassle-free. They’ll also notify you when you win, check your tickets for you, and will even deposit your winnings directly to your bank account when you win. Wshful works via a subscription model. When you sign up, you have to select one of three plans and you’ll automatically be included in multiple lottery syndicates for Euromillions and Mega Millions. You’ll also earn some awesome bonuses if you refer friends. And if, for whatever reason, you decide to cancel, you can do so at any time and your Wshful subscription will not renew once the next billing period rolls in. Creating an account with Wshful is a fairly straightforward process. You have to choose one of three subscription plans available and provide some basic information. You can also register with your Facebook or Twitter account to speed things up, then provide your payment details and that’s it! A subscription means you never forget to buy the tickets, you never have to check your numbers, you never have to worry about collecting your winnings. It’s all done AUTOMATICALLY. Follow this link to register with Wshful and enjoy a fully-automated lottery experience. Only 3 lotteries are included in Wshful’s syndicate bundles, but at least they are 3 of the biggest games around. If you want to join syndicates that include Euromillions, Mega Millions and Powerball, Wshful is definitely a good bet. Starting at $4 a week, you can join a 20-line syndicate that’s good for four weeks. Once the first four weeks are up, you are then billed every four weeks thereafter until you cancel. And the best part? Wshful actually purchases the tickets on your behalf. That’s right, there’s no lotto betting here, so you’ll actually be participating in official games. Another perk that Wshful offers is that each syndicate only has a total of 88 people in it. This means that, compared to other sites where syndicates normally go up to hundreds of shares, you can, in theory, get a bigger piece of the pie here. On top of that, you can get Powerball lines for every friend you refer to Wshful. Each successful referral translates to five weeks of free Powerball lines for you. Your friends will also receive similar bonuses, so it’s really a win-win for all. No, not at all. Wshful is complete safe to use. Your money will automatically qualify you for any winnings that your syndicates might win. Of course, there are no guarantees that you’ll win, but in case you do, rest assured that your prize money will get to you. Yes. Wshful is registered in England & Wales with Company Number 10631445, VAT EU GB295488247, at International House, 24 Holborn Viaduct, London, United Kingdom, EC1A 2BN. Yes, Wshful is guaranteed to be safe and secured. They use SSL encryption to keep players’ payment details under lock and key, for starters. Plus, they are also PCI DSS compliant, and are verified by Visa and MasterCard. In a nutshell, this simply means that using credit cards to pay for their subscriptions is guaranteed to be safe. This isn’t some fly-by-night outfit looking to pilfer your credit card details—Wshful is the real deal. Is Wshful a real or fake company? Yes. Wshful is a real company that launched online in 2017. Before that, they were a group of lottery enthusiasts that organized syndicates for friends, family, and friends of friends. You can get to more about Wshful here. Wshful is owned by Cloud Canyon Ltd, a company from London, United Kingdom. Absolutely. Lottery syndicates – which is what Wshful basically provides to their subscribers – are perfectly legal to organize and participate in. Does Lottery Critic trust Wshful? Yes. We’d go ahead and recommend this service to anyone who wants to somehow continuously play the lottery without having to manage it at all. In the event that you win, Wshful will immediately contact you via email and phone, on one condition: your winnings must be above £100 (or around $136). If, however, your winnings are £100 or less, you must manually check your Wshful account, instead. Another thing worth noting is that there are no deadlines for claiming prizes. So if, for some reason, you won’t be able to collect it upon winning, you can do so at any time without any repercussions. And if you cancel your subscription with some winnings still in your account, Wshful will transfer your it to your bank account for you—all without taking any commissions or extra charges. On the flip side, if your account only has less than £3 upon cancellation, Wshful will leave that in your account because the cost of transferring is too high—not to mention doing so is too time consuming for such a small amount. The good thing here is that if you do decide to play again, the winnings will still be in your account. However, once a whole year passes, any uncollected amount that is still in your account will be donated to Unicef. Withdrawing from Wshful is easy as it is done via your bank account. Just log in to your Wshful account and click the Withdraw button. Provide the necessary information and your winnings should appear in your account within a few banking days. Wshful doesn’t accept many payment methods, which is a bit disappointing. On the plus side, the payment methods they accept—Visa, MasterCard, Maestro and Visa Electron—are all quite popular. These at least make their service more accessible to a lot of people. However, those that use alternative payment methods (such as, say, Skrill, DineroMail, or PayPal, among many others) may find Wshful’s banking methods to be lacking. Wshful doesn’t provide an app for mobile devices. All subscribers will have tor rely on the official website to access their account. Thankfully, it’s optimized to work on phones and tablets. A mobile app might be something that some users miss, but personally, I don’t think the service really needs one. It’s not like you’ll need to access your account very often, anyway. And when you do, the website works perfectly fine. Alternatively, they also have their business address listed—in case you wanted to get in touch in person or through snail mail. Wshful’s FAQ is quite informative. It doesn’t look like it at first, especially at first glance. It appears bare, but because Wshful’s service is itself pretty simple, the information provided covers all the basics. Final Thoughts – Should You Use Wshful? If you’re a syndicate lover, Wshful definitely should be on your list. 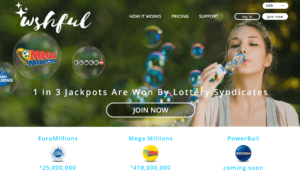 Wshful largely succeeds in offering a simple, no-nonsense lottery experience for lovers of group play games. Here, what you see is what you get—and it’s that straightforward nature of Wshful that really sets them apart from most lottery sites. I just wish there were more lottery syndicates offered or payment methods accepted, but these are but minor gripes in the grander scheme of things. Certainly, there’s room for growth, but it’s good to know that Wshful makes good use of what they have got. And that deserves a thumbs up in my book. Having played on incredible odds having all those lines open to me, after 3 month I end up with £2.31 so for me this is not a game of odds it is a games of throw your money away. The syndicates are great for creating Hype, but in reality unless you get the big one your throwing £50 a month away, check it, evaluate it, and make your own decision, mine is out, sounds good but does not live up to the advertising. I want to upgrade to Gold.